Four years ago, Mayor Muriel Bowser announced her commitment to make homelessness in DC rare, brief and non-recurring, and promised to close DC General once and for all. These goals are premised on the belief that everyone should have a safe, stable place that is home, especially in a city as prosperous as ours. Today, DC General is closed forever and family homelessness is down more than 40 percent. The Mayor’s new policies and programs have also helped more than 6,000 District families avoid needing shelter, thanks to effective preventative services. The key to being able to close DC General was to replace it with smaller, modern, dignified Short-Term Family Housing (STFH) buildings in all 8 Wards. DC General was the city’s largest homeless shelter; it was too big, too old, and too rundown to serve the families safely, and with the dignity they deserve. So in October 2018, when Mayor Bowser kept her promise and closed DC General, she also cut the ribbon on the first of three STFH programs to replace our city’s emergency family housing capacity. While each STFH program has a distinct design and place in the community, they all have in common robust individualized supports and wrap-around services designed to ease the crisis of homelessness for every family and help them achieve housing stability in a home of their own as quickly as possible. Ward 4’s The Kennedy, Ward 7’s The Horizon and Ward 8’s The Triumph are all now open and serving families. Families in these new programs will have the opportunity to pursue their hopes and aspirations in a supportive and community-centered environment. Soon, Ward 6 will too cut the ribbon on a STFH program, currently under construction at 850 Delaware Ave., SW. 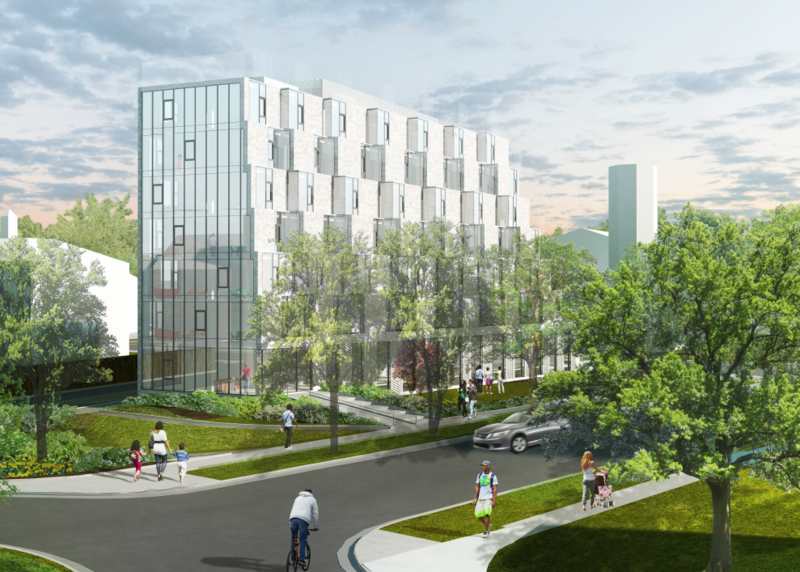 The 50-unit building is on track to open its doors this summer. Like other STFH programs, this program will provide wrap-around services to families, and will help parents locate affordable, stable housing. Dedicated play, homework and common spaces will allow children to learn and thrive. The building will also accommodate a garden-level community health clinic for anyone’s use, so that health clinic services can continue at the site. The building design, which has already received architectural recognition and acclaim, blends with the aesthetic diversity of the Waterfront neighborhood. The design and construction is managed by the Department of General Services (DGS), with architects Leo Daly and Studio 27 and Blue Skye Construction as the general contractor. The program will be housed in a new seven-story, 53,003 square foot residential building with 7-10 units for families on each floor. Its energy efficient features will meet LEED Gold standards. This is not design for design’s sake. We know from research and experience that beautiful, dignified spaces help better support families to achieve greater stability more quickly. I think it also says a lot about the values of our city, that we set out to create beautiful, welcoming and comforting places for families experiencing a very real and traumatizing crisis. 850 Delaware Ave., SW has long been a place for healing, and soon this address will again be a beautiful, purposeful place. 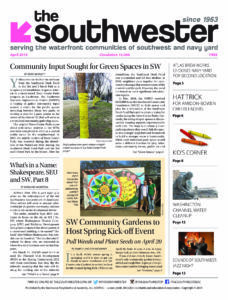 But it would not be possible without sustained partnership with the Southwest community. The Ward 6 STFH Advisory Team has led the effort to ensure this project is a best for families and best for Southwest. The Advisory Team includes representatives from ANC 6D, Amidon Bowen PTA, SWNA, the Randall School development project, neighbors, Councilmember Allen and his office, DGS, DHS and the Executive Office of the Mayor. The Advisory Team is working now to complete a Good Neighbor Protocol that will lay out the mutual expectations between the District and the community and will be finalized before families are served at the site. Please check out all of the information on the Ward 6 project as well as all other STFH projects across DC by visiting mayor.dc.gov/HomewardDC. We’re excited about our progress in Ward 6 and throughout the District, but we know we have more work to do. We will continue to work every day to make homelessness rare, brief and non-recurring, and to provide families with the supports they need to get back on their feet. Jay Melder is Co-Chair of the Ward 6 Short-Term Family Housing Advisory Team and Chief of Staff for the DC Office of the Deputy Mayor for Health and Human Services.